Mercy Flight of WNY coordinated a series of special performances throughout its service area by nationally known tenor Daniel Rodriguez. These mini-concerts at area healthcare facilities led up to Mercy Flight’s Beacon of Hope fundraiser on September 9. 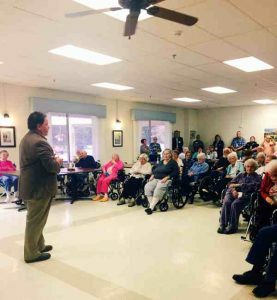 Rodriguez’s first stop on September 7 was the Jennie B. Richmond Nursing Home in Springville, where he sang patriotic and classical tunes that the residents and guests recognized with ease. Known as the Singing Policeman and the Voice the Healed a Nation, Rodriguez was a NYC police officer and was one of the first responders at 9/11. Since retiring, he has traveled the country as a professional singer. Photo 1: Daniel Rodriguez entertains residents at the Jennie B. Richmond Nursing Home with his rich tenor voice and popular American standard tunes. 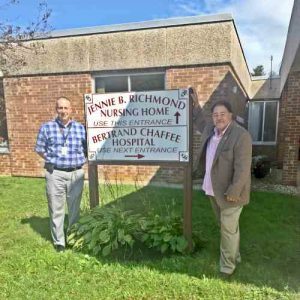 Photo 2: Don Trzepacz, Jr., director of air medical operations for Mercy Flight, and Daniel Rodriguez outside the Jennie B. Richmond Nursing Home.